Explore Scientific 12in “Ultralight” Dobsonian Long term review. 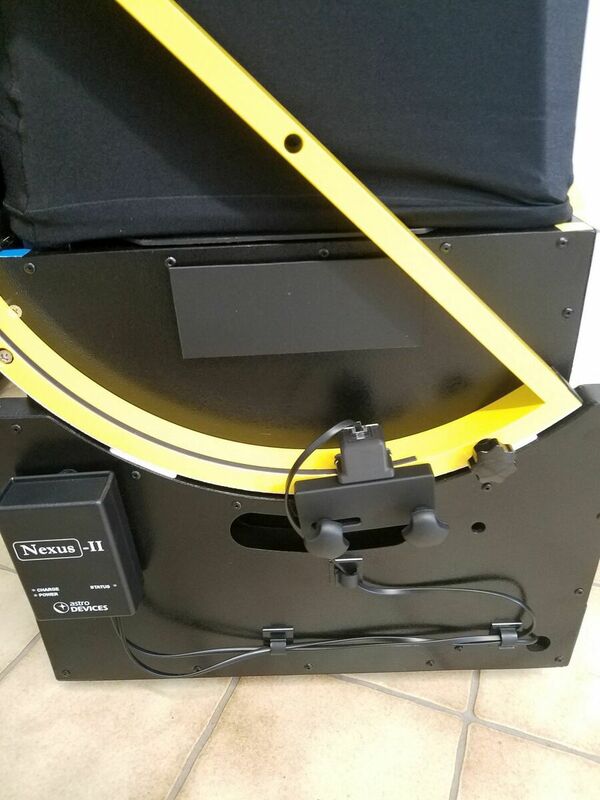 I purchased my Explore Scientific 12” Ultralight Dobsonian Gen II (ESUL) telescope August 2018. I wanted a more transportable scope, than the Zhumell Z10 scope I already owned, and the ESUL seemed to be a good tradeoff between portability and cost. I purchased the scope shipped for €1197 from Teleskope-express.de. The scope arrived well packaged in a very large box. I am not going to get into unboxing, as there are other reviews that already cover this. Also I am just going to skim over my initial impression of the scope and focus more on my long term experience, and follow up with the upgrades/modifications I made to the scope. My ESUL included the counterweights. My ESUL arrived without any metal shavings in the mirror box or base. I would still probably vacuum everything out though. This was an issue noted in a few different reviews. All of the included pieces and parts were in good shape and went together easily. It should be noted that while Explore Scientific has decided to name this series “Ultralight” however these scope are far from lightweight, the 12inch /305mm scope weighs in at about 70Lbs / 32 Kg assembled. They do break down well and are very portable once unassembled. 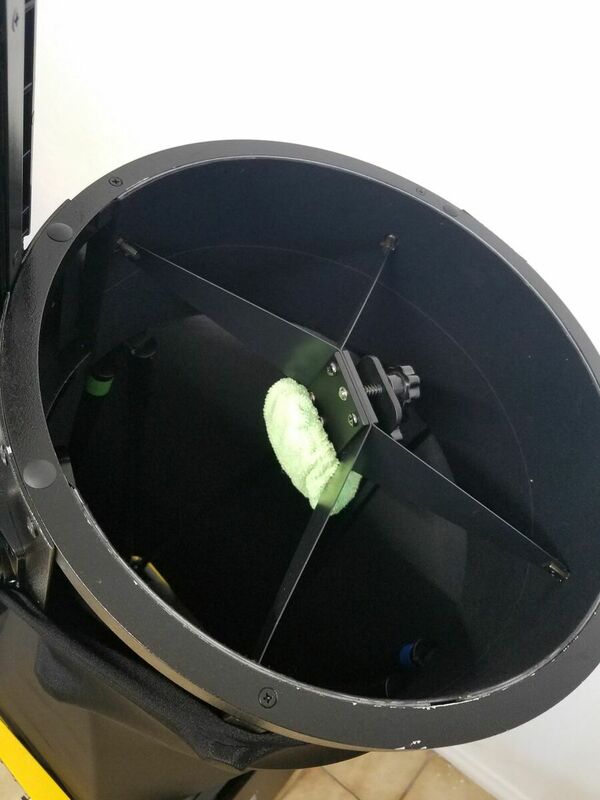 The ESUL 12” Gen II mirror cell, secondary cage, rocker box, poles, and altitude bearings are all made of aluminum. 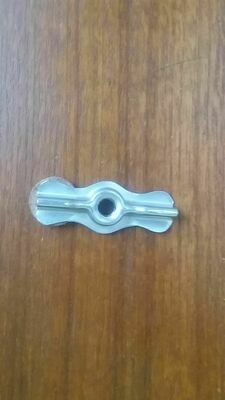 -There are rubber edge guards on the handles of the mirror cell and rocker box, (which oddly, are on the side of the cutouts that you do not actually pick up from) that have a metal reinforcement that is magnetic. -Springs, assembly screws, nuts and knobs. -2 steel plates, approximately 3/16” – 5mm that are glued to the inside of the mirror box above the fans. These appear to provide some counter weight (speculative) as they do not seem to provide any structure. -Included counter weights and rod. -Clasps that hold mirror box lid closed. The 12”version of the ESUL, while not light, is very potable. Assembles easily in the field, it gets easier and faster every time you do. I only takes a few minutes now to get everything set up. Collimation is easy due to the primary adjustment screws being adjustable at the focuser via a plastic capped hex wrench at the end of a rod. The mirrors are good in my opinion. It should be noted that based on a discussion with ES customer service the ESUL line of scopes, with the exception of the 20”, uses GSO mirrors. There is certainly better optics available, however I would surprise to find better at this price point. 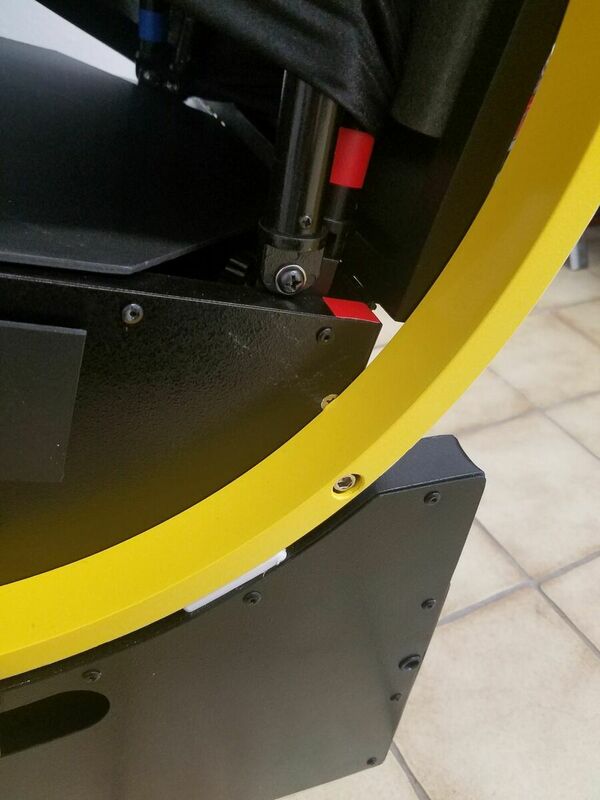 The ESUL secondary cage assembly can be rotated 45 degrees, in the event you prefer the focuser to be at a more “normal” position on the secondary assembly. 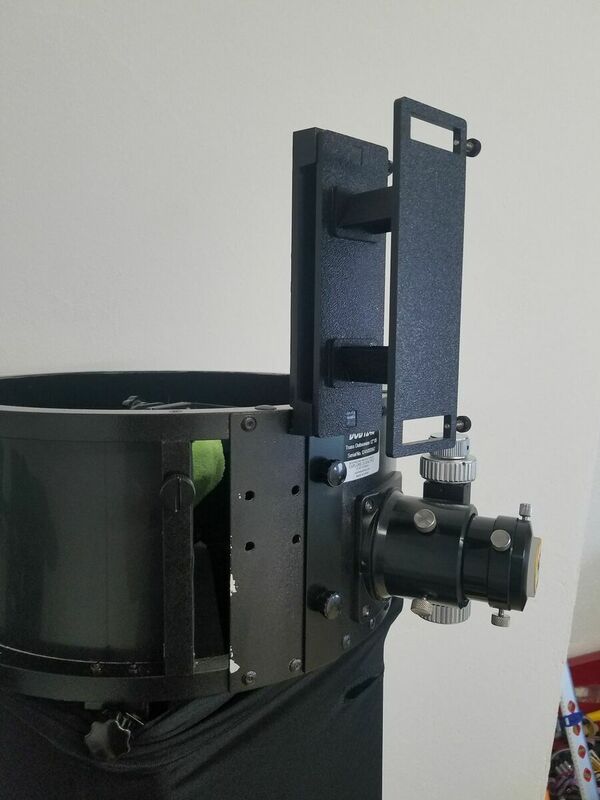 You can swap to the left side as well, however at least on the ESUL 12”, the finder shoe/scope will be located bellow the focuser. The ESUL works well “out of the box”. 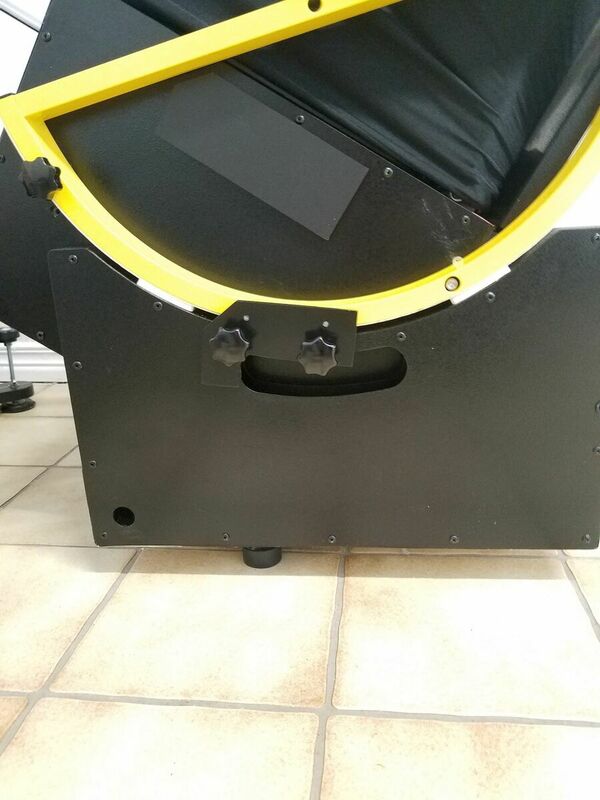 Priced well for a portable truss dobsonian. The hockey puck tensioners work to keep the mirror box centered, but provide questionable friction to keep the scope from slow dropping. You can get them to hold the scope, but it requires tightening them down and they tilt quite a bit. This could have easily been fixed by using a large washer or aluminum plate to provide the tension. They could have also made use of the two threaded hole that are available. The hockey pucks appears to be a quick off the shelf “fix” for the GEN II’s, as they also use them as the feet for the scope. The mirror box and rocker box both are held together primarily using rivets. 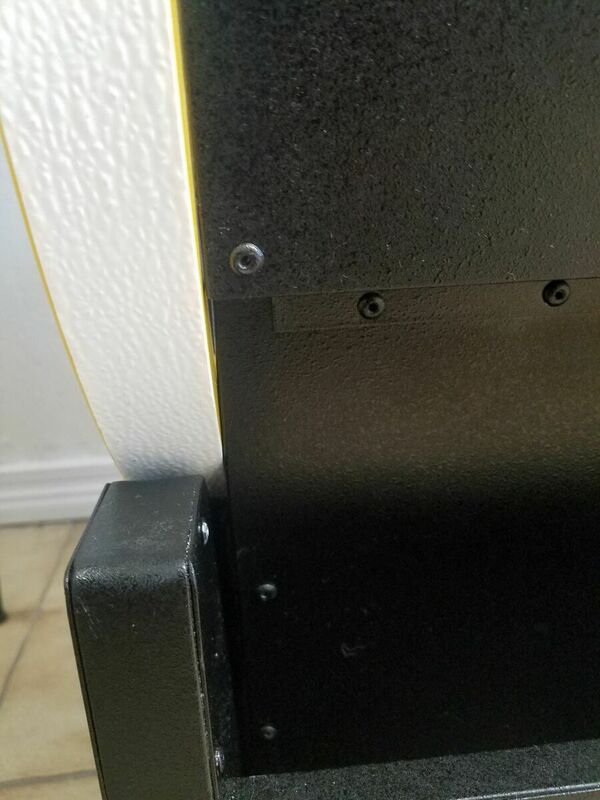 These rivets interfere with the altitude bearings, and do not allow it to sit flush with the mirror box, at least on the 12”. Mirror cell assemble has some slop due to the sleeves used. The adjustment bolts pass through the mirror cell, and mount to the mirror box, with springs that sit in between. The sleeves sit in the holes in the mirror cell, and are slightly longer than the thickness of the rectangular aluminum tubing used. The rocker box is held to the foot assemble using a hollow nut and bolt. The foot assemble is made of a plate of thin aluminum attached to a triangle of aluminum tube. 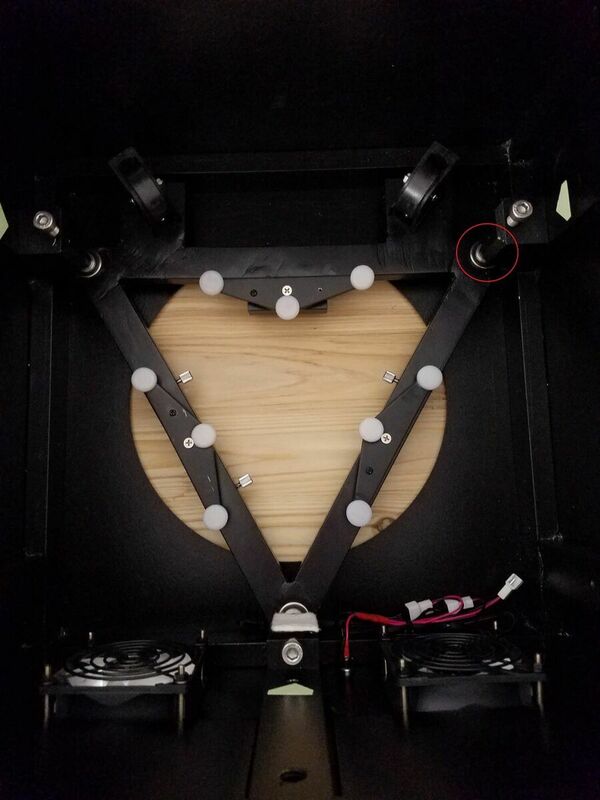 There is no reinforcement of the center of the triangle (or of the center bottom of the rocker box, so it flexes when the rocker box is transported. Paint, at least on the secondary cage and support brackets is crappy, not sure if some parts were just not cleaned well before coating, or it is just a spray on paint and not a powder coat and a self-etching primer was not used. I pulled off entire sections when adjusting my Telrad base. Sloppy finishing, obvious grind marks at the welds on the mirror cell. Manufacturing leftovers/buildup painted over in the corners. The fans are very loud, and are in reality boundary layer fans. They blow across the top of the mirror, so I do not have a lot of confidence in how well they actually cool/stabilize the mirror temps. The included red dot finder is a complete joke. It is made of a flimsy plastic, and do to the way it is assembled, the upper red dot assemble wobbles on the lower riser. It is laughably low quality, and I am shocked that Explore Scientific included it with this scope. 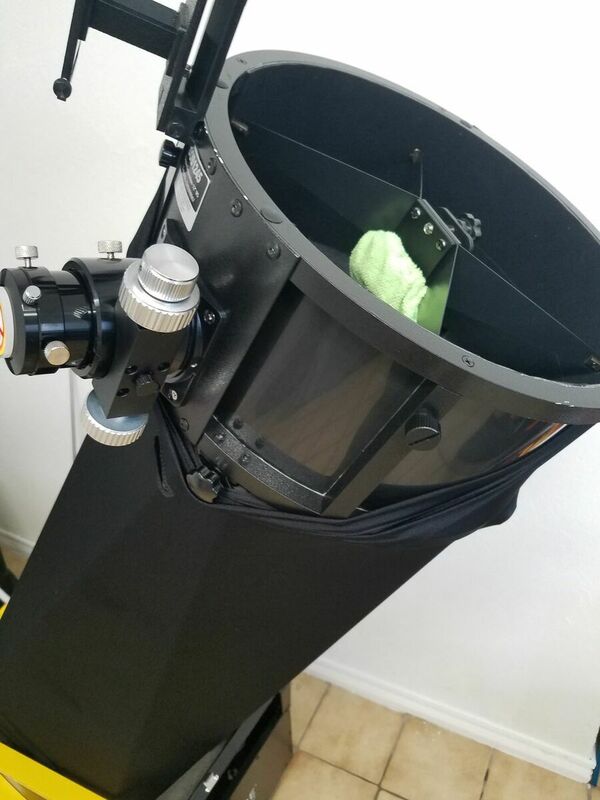 After several months of ownership I am very happy with the Explore Scientific 12” Ultralight Dobsonian Gen II (ESUL). I would still recommend it to someone looking at an economical truss Dobsonian. It does work well out of the box, assuming that you purchased the ESUL with the counterweights. Since August I was able to get scope out approximately 15 times in varying temperature ranges from 80f/26c to 20f/-6c and the scope worked well each time. My viewing areas are usually my driveway for quick views, which has a very narrow southern viewing area SW to NNE with a street light a few dozen feet away; and a farm field on a hill above the town, that has mostly unobstructed views of the 4 bortle sky. I was able to get to one viewing at “darkish” location with a 3 bortle sky. 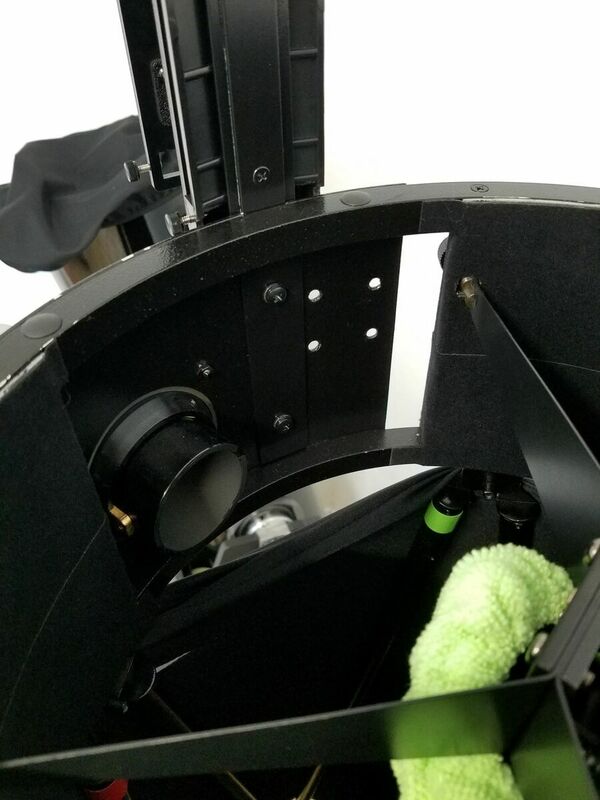 Collimation has been easy and I have found it is easy to do midsession adjustments if needed. I have had a couple of times were I seems to loose collimation after long (4 hours+) viewing sessions. During shorter sessions I have had no issues with loosing collimation. I have had no real wear and tear issues, other than chipped/rubbed paint. My view experience has been very good; the optics based on star tests and what I have been able to see has also been very good. Mars had more vibrant color and noticeable detail than I can see through my Zhumell Z10, using the same Ep’s. Saturn was amazing the couple times I was able to catch it with clearer banding and good detail of the Cassini division. DSO such as nebula and clusters are really where I found the most enjoyment with the ESUL. M57 (Ring nebula) was a nice smoky little ring. M43 (Orion Nebula) was breathtaking. M13 (Globular Cluster in Hercules) was fantastic it has always been a favorite DSO and I have viewed it more times than I can count and with the ESUL there was less fuzz, and more detailed, visible stars. With the ESUL the M13 appeared to have depth, with stars towards the center were brighter and appeared to be closer giving what seems to be a three dimensional aspect. Other fall and winter globs such as M15 were also more detailed, with less fuzziness and appeared to be more like little piles of diamonds on black felt. Overall I am very pleased with the Explore Scientific 12”/ 305mm “Ultralight” Dobsonian. 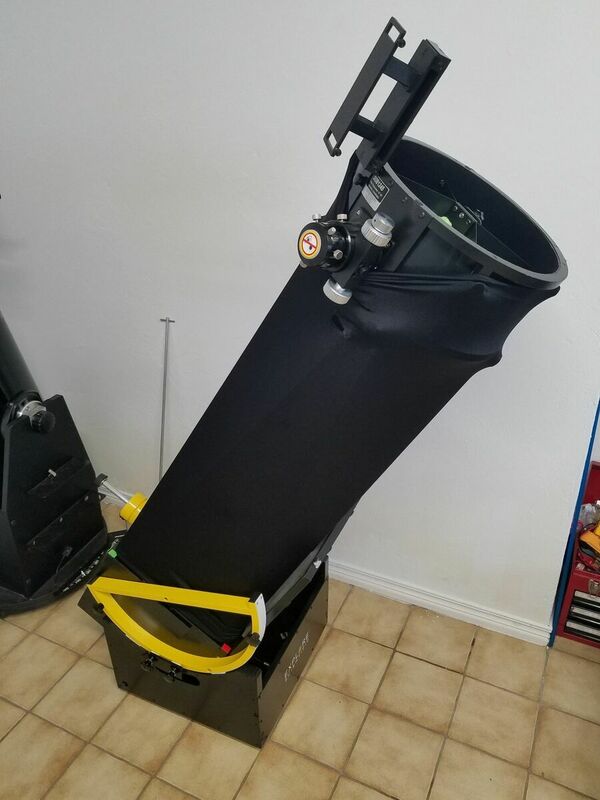 I would purchase it again, and I would still recommend it to someone who is looking for truss style Dobsonian. I will followup with a list of updates and mods I made to the scope. I will also try and update/edit this post if needed after a full year of use (August 2019). Edited by zacrobmer, 18 March 2019 - 10:05 AM. I made a few updates and modifications to the ESUL since my initial purchase. Some were completed to correct issues/bad design decisions I stated in my earlier review, but most were to improve my viewing or make my life easier. I am not going to go into detail of the construction of each mod. But I will answer any questions about them and upload more pictures if needed. Please excuse the potato pictures; I dropped the size and quality a bit, as I was unsure how much storage space the forums had for photos. Fair warning, some of the fixes or mods I made to my ESUL could (probably will) invalidate your warranty. 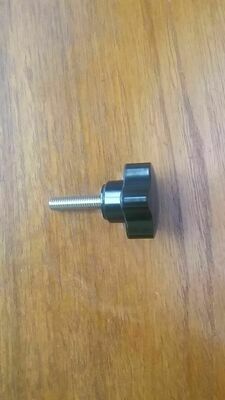 The hockey pucks work, some, but to actually apply enough friction you have to have the knobs relatively tight, the rubber pucks flex around the knobs threaded section and push top of the puck out so it sits at an angle. I fabricated a bracket to replace the hockey puck tensioners and allow a good deal of tension to be applied the bracket also uses both available threaded holes. It has two 3mm thick 1cm x 2cm pieces of PTFE pads that touch the altitude bearing, and piece of felt at the bottom part that touches the mirror box. 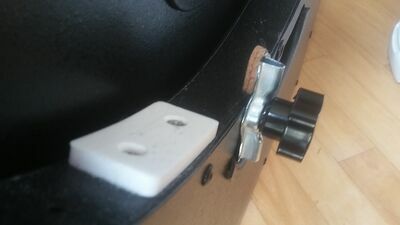 I originally used a PTFE seal glued to a fender washer for the opposite side so there was a stop for the altitude bearing to run against, and so the mirror box would not rub against the side of the rocker box. I have since added a Astro Devices Nexus II and encoder kit, with took the place of the seal/washer. There are rivets on each side of the mirror box (two on the right) that interfere with how the altitude bearings fit against the mirror box walls. 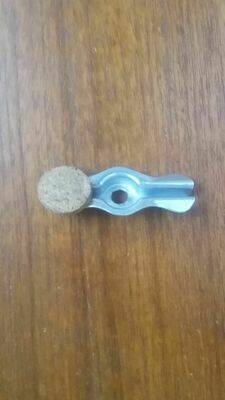 This causes the bearings to tilt outwards, and leaves a gap where the bearing is mounted to the box lid. I felt it was best to drill out the two rivets, slightly countersink the hole and install M3 screw and bolts, rather than add a divot or hole to the bearings. This provided a flush mounting point for the bearings. While I had the mirror removed and the cell disassembled I noticed a couple of the clear rubber bumpers that sit between the mirror and the cell had shifted, and then one magically disappeared. So I removed the pads, made some inquiries about replacements and installed nylon furniture caps in place of the bumpers. These are the nail-in type, so I drilled three holes per bracket and snipped the nail so the nail would be flush, and then epoxy them on. I replaced the stock fans with lower RPM lower mA fans (Arctic Cooling F8 80mm fans) they move more than enough air for boundary layer fans, but are much quieter, and use less power than the stock fans. While I was doing that I also rewired the power connector to allow for a third fan and make changing fans out easier in the future. 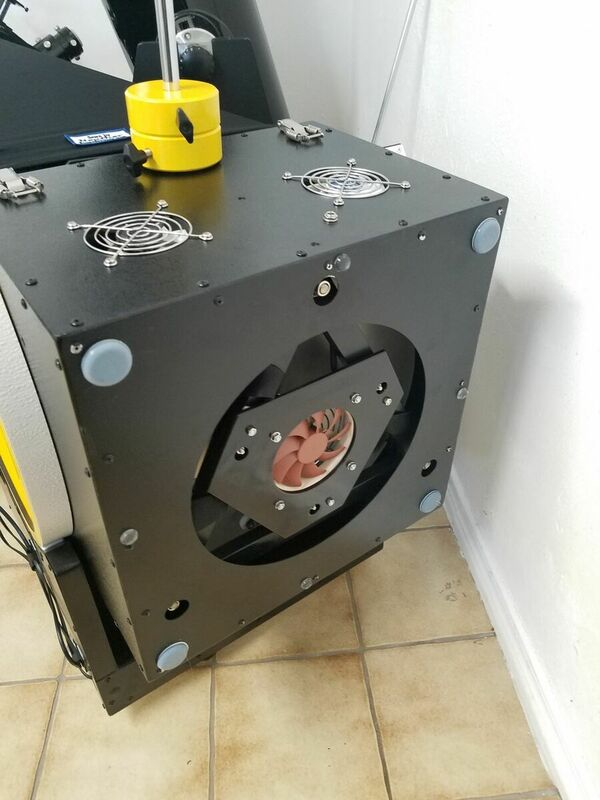 I fabricated a fan mount, and used a 92mm fan to blow directly on to the mirror from the bottom. I used a 92mm Noctua 92mm X 14mm “thin” fan (NF-A9X14). The first real mod that I made to the ESUL was to enclose the secondary cage. I found that stray light shield enclosed with the scope was inadequate to stop glare and severe contrast degradation when viewing at a location where there are exterior lights. Viewing from my driveway the first couple of times was very frustrating due to the street lamps and cars driving by. I removed the focuser assembly, finder shoe and secondary spider assembly. I decided to use a thin 1mm ABS plastic to enclose the inside of the cage, and then added a layer of black felt flocking material. I wanted a semi-permanent solution so I used 3M VBF tape to attach the ABS to the cage. I purchased a shroud from Shrouds by Heather; this is a fantastic high quality custom shroud. For me it cost as much shipped as the Explore Scientific one, so this was a no brainer. I highly recommend at least checking them out if you are planning on using a shroud. I have some neck issues, and due to the focuser being on the right side I was having a hard time getting behind the Telrad I had mounted in place of the finder scope. So I fabricated a mount that allowed me to push the Telrad out past the edge of the secondary cage. I made it out of 20mm and 30mm bar stock aluminum bar stock that I brazed together for rigidity. It has a longer piece that the mount is attached to, and a short piece that sits inside the cage. It comes off easily for travel. I also made covers out of thermoplastic for the mirror box handles and mirrorbox. Changed the feet from the stock hockey pucks to smaller rubber cabinet feet. I plan on making a leveling platform for the ESUL, for when I use it out in the field. Color coded the truss poles so I can attach them to the same mount every time. This seems to help with the secondary collimation. I have to collimate every time, however with the same poles in the same mounting location every time there seems to be less drastic changes each set up. I also added a CatsEye center spot. I purchased an Astro Devices Nexus II for myself for christmas. Astro Devices has a ready to go encoder kit for the Explore Scientific Ultralight dobs. I am comfortable star hoping with a Telrad and charts, but wow what a huge difference having a real DCS makes. There may be a couple more things that I am forgetting and will update if needed. Edited by zacrobmer, 18 March 2019 - 10:18 AM. Good to hear that yours came without metal shavings. I picked one in 2016 and turned out it was full of them. Maybe ES has learned its lesson! Edited by DHEB, 18 March 2019 - 10:12 AM. I like what you did to replace the hockey puck "tensioners" for the altitude bearings. Thinking about rigging up something similar, as the supplied hockey puck tensioners aren't very effective at tensioning. I see you put furniture sliders on the bottom of the mirror box. Me too, with felt sliders, as well as a couple on the sides, as interior spacers, and a couple on the bottom back side, to keep the back bottom edge of the mirror box from banging into the rocker box at zenith. Edited by Dana in Philly, 24 March 2019 - 12:49 PM. Yeah I put the furniture pads on when I installed the third fan, it sits just about flush with the base and I did not want any chance of the fan being pushed up. I went with the teflon pads because they are a little thicker than the felt ones, and when the scope is disassembled I can scoot it around the workbench or floor without it grabbing. There are a couple of the clear bumpers inside the rocker box, almost a necessity. The tensioner upgrade was well worth it, having the extra pads making contact with the altitude bearing makes a huge difference over the hockey pucks. Here's my current hack to replace the stock hockey puck tensioners. 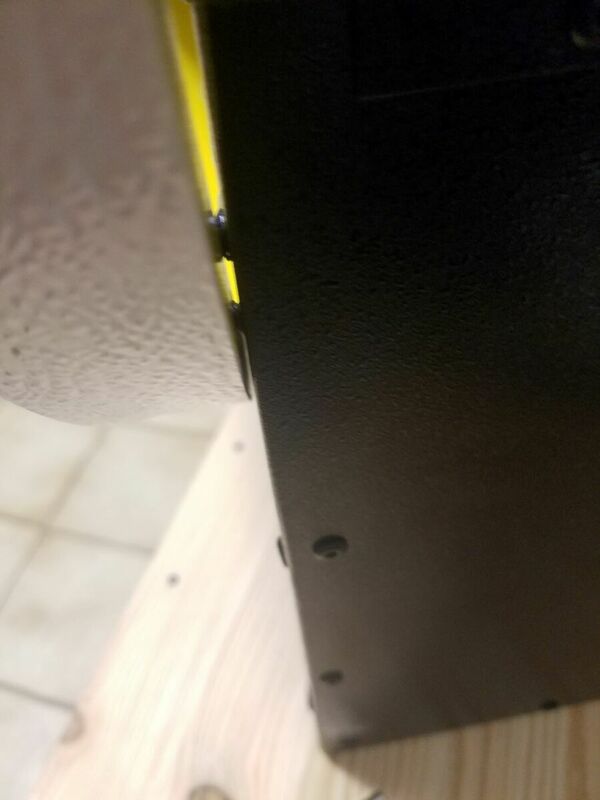 Fits nicely over the rivet at the opening of the hole in the rocker box, such that its bottom face is flush to the surface. You get the idea. Tighten down the knobs to increase tension on the altitude bearing. Tighten them all the way to stop the bearings from moving. Works very well. Cheap. I'll experiment with different surface materials other than cork in the future, but cork works quite well. Edited by Dana in Philly, 20 April 2019 - 02:00 PM.